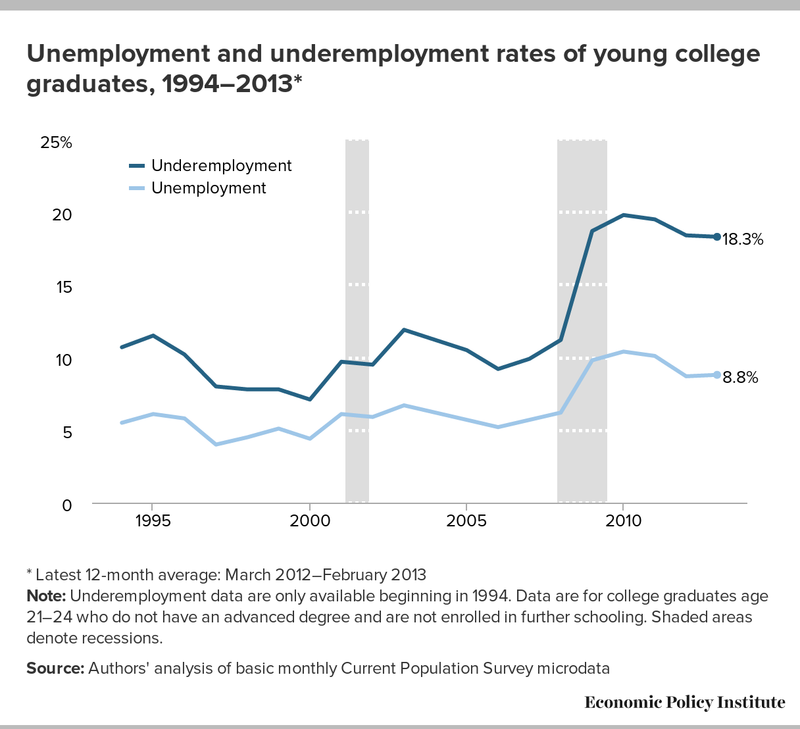 The large increase since 2007 in the unemployment and underemployment rate of young college grads, along with the large increase in the share of employed young college graduates working in jobs that do not require a college degree, underscores that today’s unemployment crisis did not arise because workers lack the right education or skills. Rather, it stems from weak demand for goods and services, which makes it unnecessary for employers to significantly ramp up hiring. The figure below, from this report on the labor market prospects of the Class of 2013, gives unemployment and underemployment rates for college graduates under age 25 who are not enrolled in further schooling. The unemployment rate of this group over the last year averaged 8.8 percent, but the underemployment rate was more than twice that, at 18.3 percent. In other words, in addition to the substantial share who are officially unemployed, a large swath of these young, highly educated workers either have a job but cannot attain the hours they need, or want a job but have given up looking for work. It should be noted that the measure of underemployment used in the figure—BLS’s U-6 measure of labor underutilization—includes hours-based underemployment (i.e., part-time workers who want full-time work), but it does not include “skills/education–based” underemployment (e.g., the young college graduate working as a barista). Economist Andrew Sum of Northeastern University has a paper coming out soon that offers insight into skills/education–based underemployment by categorizing occupations according to whether the U.S. Department of Labor, Employment and Training Administration’s O*NET system characterizes them as requiring a four-year college degree (paper forthcoming). First, it is important to note that even in good economic times, a high share of young college graduates work in jobs that do not require their college degree. For example, Sum finds that in 2000—when jobs were plentiful and the unemployment rate was 4.0 percent—40 percent of employed college graduates under age 25 worked in jobs not requiring a college degree. However, the share of young college graduates working in jobs not requiring a college degree increased over the 2000–2007 business cycle, increased further in the Great Recession, and has not yet begun to improve. Sum finds that in 2007, 47 percent of employed college graduates under age 25 were not working in jobs requiring a college degree, and that this share increased to 52 percent by 2012. The weak job prospects for these newly-trained, highly-educated workers underscores that today’s unemployment crisis is not due to workers not having the right education or skills, but from weak demand for goods and services, which makes it unnecessary for employers to significantly increase hiring of workers at any level of education. For more information on our economy’s broad-based weak demand for workers regardless of industry, occupation, or education level, see these brief snapshots.